Gary Barber's Wonder Gadot added the second leg of the Canadian Triple Crown to her growing resume on Tuesday, powering to a 5 3/4-length victory in the $400,000 Prince of Wales Stakes at Fort Erie racetrack. The 3-year-old daughter of Medaglia d'Oro, ridden by John Velazquez for trainer Mark Casse, led throughout to complete 1 3/16 miles over the sloppy main track in 1:58.71. The Queen's Plate-winning Wonder Gadot was sent off as the 2-5 favorite for the Fort Erie feature. 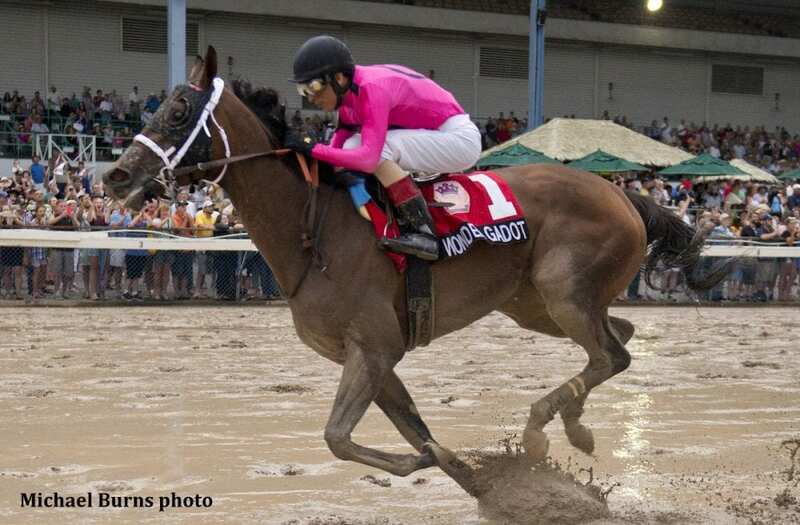 Wonder Gadot broke sharply, leading the six-horse field under the wire for the first time. She was pressured by Cooler Mike at her hip through a first quarter in :23.65, and those two pulled away from the rest of the field by several lengths down the backstretch. The pace eased up a bit as the frontrunning filly clocked a half-mile in :48.03, but the gap between the leading duo and the rest of the field remained at least five lengths approaching the far turn. Aheadbyacentury shook loose from the back half of the field and advanced on the leaders just as Wonder Gadot pulled away to a solid one-length lead, marking the six furlongs in 1:12.96. Aheadbyacentury ducked to the rail, inside of Cooler Mike, to make his run around the far turn, but was still 1 1/2 lengths behind Wonder Gadot at the top of the stretch. Wonder Gadot was never seriously threatened down the lane. Aheadbyacentury was second best, while Cooler Mike held third over Eskiminzin. Bred in Ontario by Anderson Farms Ontario, Wonder Gadot was an $80,000 yearling at the Keeneland September sale. Eisaman Equine pinhooked her through the OBS April sale, where she brought $325,000. The filly broke her maiden on debut, then added the G3 Mazarine before a sixth-place finish in the Breeders' Cup Juvenile Fillies, and in December won the G2 Demoiselle. In 2018, Wonder Gadot finished second or third in her first six starts, including a runner-up finish to Monomoy Girl in the G1 Kentucky Oaks, beaten a half-length. Her first win of the season came in the Queen's Plate, and the Prince of Wales improves her record to 5-4-3 from 13 starts, with earnings of over $1.4 million. Casse didn't rule out the possibility of taking a shot in the third leg of the Canadian Triple Crown, the $400,000 Breeders' Stakes over 1 ½-miles on turf, which is slated for Saturday, Aug.18 at Woodbine. While the prospect of becoming the first Triple Crown champion since Wando completed the series in 2003 is of huge appeal, Casse is keen on a rematch with Monomoy Girl. Monomoy Girl has since added Grade 1 wins in the Acorn Stakes at Belmont Park and the Coaching Club American Oaks at Saratoga Race Course. Wonder Gadot exited the Kentucky Oaks to finish second in the Woodbine Oaks, ahead of her Queen's Plate coup. With Monomoy Girl expected to make her next start in the Grade 1 Cotillion Stakes, at Parx, Casse is contemplating the Grade 1 Alabama Stakes, a 1 1/4-mile dirt race at Saratoga. “We'll probably try to go to the Alabama and then the (Breeders' Cup) Distaff. We know she likes Churchill Downs, so that's definitely something we're going to point for as well,” said Casse. The Breeders' Cup Distaff, at 1 1/8-miles on the dirt, is slated for Nov. 3 at Churchill Downs and would be a fitting site for a potential re-match for year-end honours in North America. “I have the utmost respect for Monomoy Girl and she'll be tough, but if anybody can beat her I think we can. We're not giving up,” said Casse. This entry was posted in NL Article, Racing and tagged Canadian Triple Crown, Fort Erie Racetrack, gary barber, john velazquez, kentucky oaks, Mark Casse, medaglia d'oro, prince of wales stakes, queen's plate, wonder gadot by Paulick Report Staff. Bookmark the permalink.